Every January, we have a habit of re-evaluating what we’re doing. What worked last year? What didn’t work? What needs tweaking? If you’re like most business owners, you also think about new goals. Did we hit our revenue targets for last year? What is a realistic number for this year? How do we get there? As a business owner whose team spends all of our time thinking about how we can grow our clients’ businesses, the topic of increasing revenue (at least for our clients!) is never far from my mind. And being a lover of technology and a user of all manner of web and marketing tech — OK, I’ll admit it: I’m a geek and have been since my childhood — I spend more than my fair share of time evaluating how technology helps (and sometimes hinders) our efforts to grow our businesses. 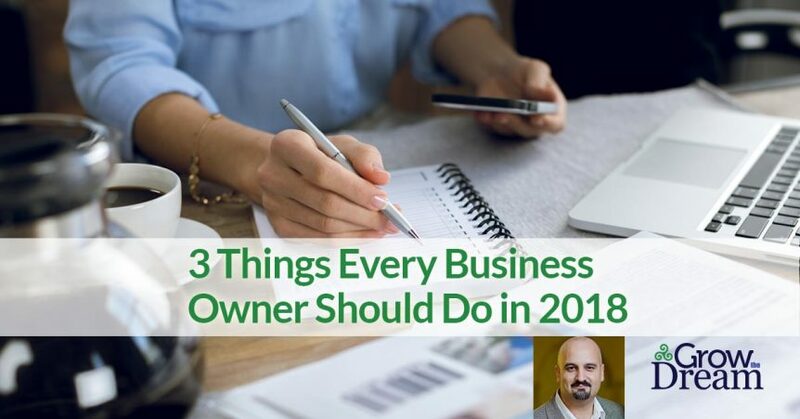 With those things in mind, here are 3 areas that I believe are critical for you to have on your radar in 2018. Use this as you see fit, but I see it potentially having an impact on how you plan for the new year with your team (or for yourself if you’re a solopreneur). More than ever, we store critical information “in the cloud.” We sign in to apps. We use web-based software tools. It seems like our lives are made up of an endless string of sign-in forms. When was the last time you evaluated your own security practices? Whether it’s keeping sensitive customer data safe or protecting your computers (and your business) from being hijacked by ransomware, security practices in your daily habits and those of your colleagues, employees, and contractors are more critical than ever. At the very least, using a good password manager (we use and recommend LastPass) will eliminate the worries that go along with generating sufficiently complex passwords and, perhaps more importantly, remembering them. If you use the same password on more than one website/app, or if you’re still using “monkey123,” here’s some helpful information on why you should choose passwords that are hard to guess. But conducting an informal security audit of your business is a really good idea. And it allows you to identify potential areas where your business is vulnerable to an embarrassing and expensive hack. Where do you store important passwords for your business accounts? Your business Facebook Page should be accessed by individual users’ normal Facebook sign-ins, but that means that their password habits represent an area of potential vulnerability. Other social media platforms like Instagram, Twitter, and Snapchat rely upon a single username/password combination that often needs to be shared with team members. How secure is that? What practices do you have in place for routinely evaluating who has the keys to the kingdom, so to speak? Do you and your team know how to recognize phishing attacks? Here are a few pointers if you or your team could use a refresher. Do you know who has access to your Dropbox, Google Drive, and other cloud file storage systems? That previous employee who signed in with their personal account, that contractor who needed access, or the person you shared that big file with who then shared it with someone else, and so on. All of these are areas worth reviewing from time to time. Is your website being properly maintained? If you’re like many small businesses, your website runs on a popular CMS like WordPress. Is the software up to date? What about plugins, themes, and other scripts and tools? Are they updated to the latest versions? Are they being properly maintained by their developers? Does your website use HTTPS? Not only is this an important security practice to help keep your website safe from would-be hackers who might “sniff” your login credentials, but it’s also gives your site a valuable boost in Google’s search engine results. Don’t know where to start? Here’s our guide for converting your website to HTTPS, including specific instructions for WordPress. A more thorough security review may be in order, depending upon your business and how it operates, but hopefully the above list will give you a few ideas about where to get started. No matter how determined we are to get the most critical things done on a regular basis in our businesses, things happen. The authors of The 4 Disciplines of Execution call it “the whirlwind.” You’re familiar with the whirlwind—it’s the day-to-day chaos of running a business that keeps us from doing the “wildly important” stuff that helps us get where we’re going. One way that we can help ensure that the critical stuff actually gets done is to automate the important tasks in our business, where ever possible. One simple example occurred several years ago when we helped one of our clients develop a system that automatically sends a few carefully-crafted follow-up emails on behalf of their salespeople subsequent to key interactions and milestones (e.g. scheduling an appointment, sending a proposal, following a real-estate closing, etc.). The initial system was fairly simple, and right away it gave them a boost to their closing rates. And by “boost” I mean that their closing rates when up 150%, from ~20% to ~50% of their sales opportunities. And I’m sure they are. That is, I’m sure they’re determined to. After all, their income (and yours!) depends upon it, right? But like all of us, the important gives way to the urgent and even the hyper-critical stuff can be neglected. (In case you’re wondering, we built that follow-up system with Infusionsoft, which remains the platform of choice for us when it comes to automating the marketing and sales functions in our clients’ businesses). Add new leads to follow-up email sequences. Invite them to stop by your retail business (and offer them a special deal while you’re at it! ), encourage them to take advantage of a free trial, win their trust by educating them, offer to schedule a call or appointment, or just make them feel welcome! Infusionsoft is a great tool for this, but automation is now available in MailChimp as well! Welcome a new customer by sending them important “how to” information, introducing them to your team, or inviting them to refer a friend! If you’re afraid you’ll forget to to do this, you can set it up to happen automatically when they get entered into your accounting system. Use Zapier if you’re on popular accounting software like Quickbooks and use email systems like Infusionsoft, MailChimp, Aweber, and others. Send simple “project management” updates to your clients when various milestones are reached in your service business. Remember your customers’ birthdays. Every time. Automatically send them an opportunity to tell you about their birthday by dropping them an email with a special “birthday” offer, then set up automation to reach out to them. This can be as simple as an emailed report that goes to someone from your team once per month so they can do “birthday cards” (this is old school, but it works!). Or it can be more sophisticated and automatically drop them a “happy birthday” email on their big day! These are just a few ideas. But each one of them can go a long way toward making your customers feel special! We all know that things change faster than ever. What to you do to stay up-to-date in your industry? On technology? On marketing? Email is one way to approach this, but it’s easy for it to become overwhelmed by the sheer volume of inbound email we all receive constantly. Sure, you can set up rules in your inbox to sort the important stuff out from the less important stuff, but when do you ever take time to dive back in and look at the stuff that wasn’t urgent at the time? Surfing the web and following links you see in your social media channels certainly helps, but very often I find myself wasting time or following rabbit trails if I allow myself too much of this unrestrained activity. First: a good podcast app. Commuting and exercising are both fantastic opportunities to make excellent use of your smartphone and stay current on the topics that can have a positive impact on your business. Podcasts are available for every possible topic, and although you might have to try a few of them before you find the ones that are the best fit for you, the time and energy you invest in this can pay off in a big way. If you’ve never tried a podcast app, I recommend giving PocketCasts a try. Install it in your iOS or Android device, and once you’ve identified the podcasts you’re interested in, the app will manage things from there. It will automatically download new episodes for you and keep track of which ones you’ve listened to (and where you are in a given episode if you’re like me and don’t always complete them in one sitting). This hearkens back to #2 (“Automate the Important”) above, because it allows you to set it and forget it! Each time you have an opportunity to listen, you’ll always have something valuable to hear. Incidentally, some of my favorite podcasts are Security Now (hearkening back to #1 above, but fair warning: this is 2-hour weekly geekfest), Experience This (loaded with exceptional customer service/experience stories), and the Ziglar Show (carrying on the legacy of Zig Ziglar with tons of benefit for business owners and sales professionals). The bonus of that last one is that it’s co-hosted by my friend, Tom Ziglar. Once you come across a great source of information that’s particularly relevant for your business, how do you make sure you don’t miss their content in the future? Sure… you could sign up for emails, but we’ve already covered why that’s not optimal. Feedly subscribes to blogs, websites, and news sources for you. It collects everything in one nice, easy-to-use format, and eliminates distractions so you can digest the material you need quickly and efficiently. Back in the day, I was a big fan of Google Reader. But, it went the way of all things back in 2013 when Google gave it the ax. Feedly is the “spiritual successor” of Google reader, and if you incorporate it into your routine, you’ll find yourself staying ahead of the curve in 2018 in ways you might not have imagined possible. And yes, there are apps for your smartphone, although I tend to prefer just opening it in the browser on my laptop. And yes: you can subscribe to the Grow The Dream blog there. What’s on your radar for 2018? I look forward to reading your comments (add yours below) about what’s on your mind as you make your plans for this new year. And may this one be your best year yet!